Discussion in 'Knives, Axes, Hatchets and Machetes' started by Barhrobeman, Jan 15, 2018. Any Ka-Bar fans out there? I'm not big into knives, but I have a couple of Ka-Bar's that I like pretty well. I have a Bk2 and a USN MKI, both are nice tools. I'm not into the whole "batoning thing," but I thought I'd give it a try once. I guess it works, but it seems like a good way to F up a blade, and why not just pack a hatchet? nitesite, SHOOTER13 and Elbert Garrett like this. Great knives! I carried one strapped to my web gear back in the day and I`ve had one every since though I don`t have much call to carry it these days.....it`s just collecting dust on a shelf. meanstreak and SHOOTER13 like this. In my Jeep right now...attached to my bug out bag. meanstreak, nitesite and Elbert Garrett like this. I usually just keep mine in their box until I'm heading out to use them. If I'm taking my shotgun I'll strap the BK2 sheath on the scabbard and roll out. I haven't had any luck w the plastic sheathsthey come with not dulling the blades. So got a leather one for the USN and a polyester for the BK2. The one on the left weighs a full lb.. The fighting knifes are cool but too big to be useful in many areas other than fighting. Let me cut this rope with my sword right quick.. If I'm going to be in a knife fight, I'm brining a gun. My BK2 is really a little big to do a lot of "daily" task. It'd be good for busting out a car window or something incase of emergency though. I'd love to own a BK2. I like axes and machetes and hatchets and parangs and stuff and the BK2 looks like it would be awesome around a camp. I would punish that knife and smile all the time I was doing it. I actually considered getting one. I went smaller and lighter by getting an ESEE-3 after I saw the Becker was a foot long. You might have chosen right. The scales that come with it are kinda jinky and the plastic sheath dulls the blade every time you pull it in and out. 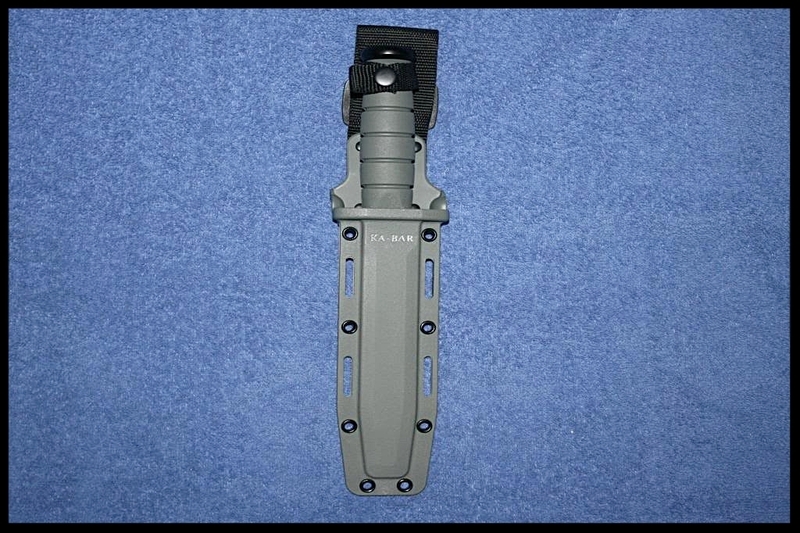 So, if one gets a BK2 for sure figure in the cost of another sheath and possible aftermarket scales. 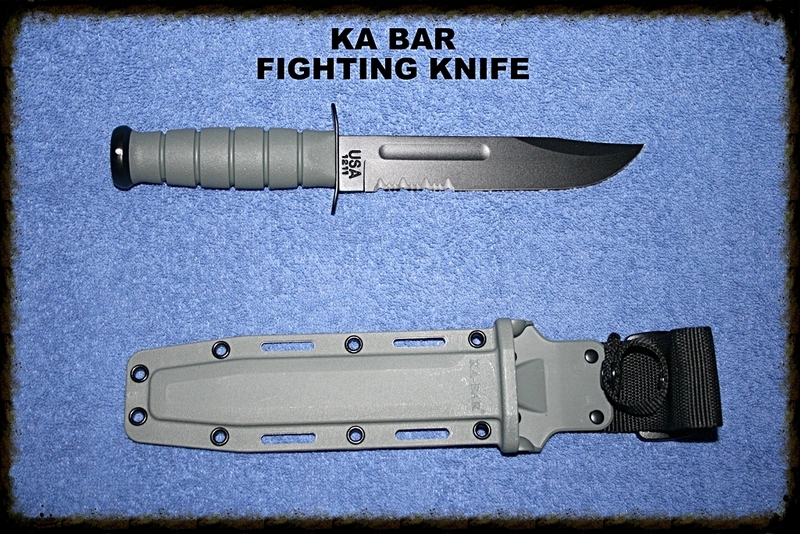 Ka-Bar has a polyester sheath that works well for it, it's just not so attractive and it's sold seperatly. Djcala and meanstreak like this. meanstreak, Elbert Garrett, nitesite and 1 other person like this. meanstreak, Elbert Garrett and nitesite like this. meanstreak, Djcala, Elbert Garrett and 2 others like this. That's the knife I saw about an hour ago. Asking $65. It's used but in very good condition as is the sheath. Well, I went back to the knife shop and grabbed the Ka Bar and the small folder. The sheath had staples where rivets should be. I have a friend that can change that. The owner knocked off $15 . I ended up with both knives for $85, that included tax. Rip, those are some beautiful handles on your blade.